I’m Capt. Craig Price and I’m a USCG licensed, master rated captain who operates a full service professional guide business. I am insured for commercial charter operations, and trained in first aid/CPR. My boat is a custom built, “down east” Intruder 23 ft. skiff “Pretty Work II”. She’s a stable and spacious fishing platform. My electronics and tackle are all top quality. I am a registered Select Angler on Pure Fishing’s professional guide support program, which features well-known brands such as Penn, Berkley, Fenwick, Pfleuger, Abu Garcia and more. Locally born and raised in Gastonia, NC, I have spent innumerous days on the Catawba River and its impoundments. As my experience and skill levels grew while fishing for everything from ocean pelagics to landlocked stripers, so have my areas of operation. I now run charters on many freshwater impoundments and rivers in central/western NC & SC, plus inshore saltwater charters on these coasts. I write fishing/boating articles for print publications like Angler Magazine and various local newspapers. I have been featured on the TV shows Carolina Outdoor Journal, 704 Outdoors, and an upcoming episode of Bob Redfern’s Outdoor Magazine. I am the founder of the charitable 501c3 organization Fishing For Cures Inc. Our team runs a fishing tournament & shore party each fall in Denver, NC in support of the American Cancer Society. 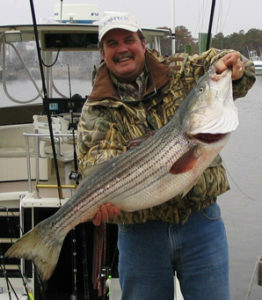 You can learn more about our efforts and how you can help at www.fishingforcures.org. From beginners to master anglers, and singles to parties of families & friends, or corporate groups, I can handle your charter needs. If you prefer a sightseeing outing from a private boat, I provide those too. Many guides promote “light tackle” fishing, which is often code for “we’re going after small fish”. My light tackle charters target the biggest, hardest fighting fish I can find. As my old buddy Bad Brad the Dancing Shad taught me – “if you always do pretty work, you’ll always have work to do”, so join me for a fishing adventure soon, and get ready for some Fish On! Thanks again for a great trip this past Saturday. I have gone to the coast and fished a few times – this was the best so far. Thank you!